Americans have active lives and tend to travel about through the day. Unfortunately, our active lifestyle makes it easy to lose track of the kids. 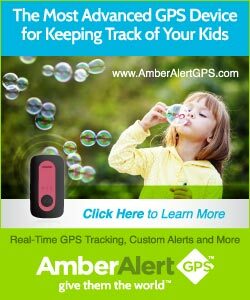 The Amber Alert GPS is a tracking device for kids. The unit uses the cell phone system to show you the current location of the device. It even has a button that lets your child send your cellphone an emergency text message. Using the device, you can get a stream of waypoints showing its location throughout the day. Plotting the waypoints on Google Maps will give you a detailed map of the day. The program is small enough that you can hook it to a belt of place it in your child's backpack. The Amber Alert GPS device is especially valuable when traveling. The device can help a family regroup if separate on the road. One can also make a fun map with the waypoints.